Elevator Games presents Celleste for the iPhone. Celleste is a 3D protector game and it lets you take control over the forces of the universe in order to help a group of cows that inhabit a small planet fight against other unfriendly forces. Celleste is made by Elevator Games, and the whole goal of Celleste is to protect the planet inhabited by cows. 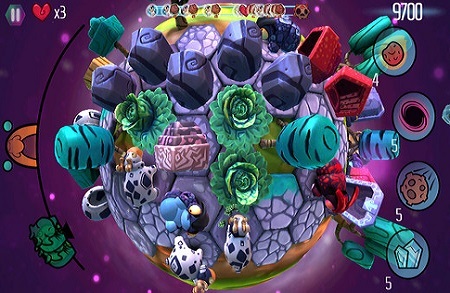 Players are in charge of a tiny world; as the player, you have to Swipe from left to right across the screen to find the cows and wake them up. They will head toward the shiny portal, munching cabbage heads in the ground along the way. Once the obstacles in the cows path are gone, they will have a clear path to safety. Like many other god-games, you will have to protect the cows from strange bug-like creatures, which appear from caves and head straight for the nearest cow. The job of the player is to smash them, by tapping them away. To move quickly, or faster from parts of the world to another, players have to swipe across the left side of the screen (where the cow meter is) so that they can find any cows that are in danger, and if they are, they will change color; such as going from green to yellow, to orange, and than to red. Tap on a cow to quickly transport and to defend it. You can get Celleste in the App store for $2.99.